The problem with video games – there is only one – is that you generally can’t swallow them or choke someone with them. That’s why board games exist, and thrive. 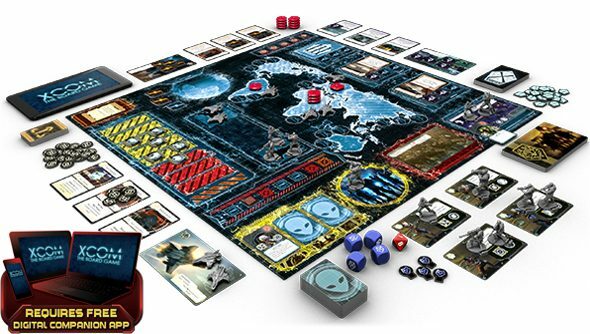 If you’ve ever thought, while playing XCOM, that it would be even more satisfying if you put your hand into the screen, lift up your soldiers, and eat him, then you will be pleased to know that XCOM: The Board Game is a thing, and it is a thing with tiny pieces. It’s also cooperative, so you can lead the XCOM Project with a bunch of your chums, each of you taking on the role of one of the department heads, from Commander down to Squad Leader. While it has the traditional trappings of a board game from dice to cards, it also uses a companion app to drive the action forward. You cannot swallow the companion app. While you and your chums are managing budgets, assigning research projects and fiddling with satellites, the companion app coordinates the alien invasion, utilizing various invasion plans. The department heads will need to scramble to deal with different crises and assaults carried out by the aliens, and it takes place in real time, with the app sending out orders as well as tracking the time the team has allotted to deal with each incursion. The app will also dictate how many crises players face. Like XCOM: Enemy Unknown, hard choices have to made about which crisis to respond to. And all the time, the aliens are hunting for and besieging the XCOM base. How vigorous they are in their search and assault depends on the invasion plan. Once the players have determined how to approach a crisis or carry out an action, an untimed resolution phase plays out, with players rolling dice – relating to the resources committed to the action – to roll successes. But there are only two successes on each die, which could call for repeated rolls. The problem is that, each time there’s a roll, the enemy threat increases. It all sounds a bit tense, and very XCOM. XCOM: The Board Game is due out later this year.